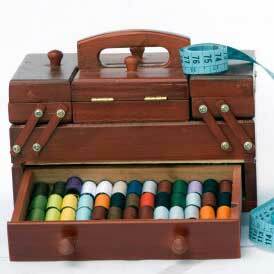 Learn How to Make a Fabric Box with this easy to follow video tutorial. You'll find tons of ways to use your new creation. Make a decorative fabric box for your home. Maureen Wilson leads you through this sewing process. In the end, you'll know how to create fabric boxes and bins, perfect to use for storage in your living space. I love to use these fabric boxes because they are pretty to look at and you can make them any size you want. The pellon in the sides and bottom make these more sturdier than the ones you buy and you can also choose your own fabric to match your decor. This video shows you step by step how to make them and it is very well done. Add yourself some embellishments for that added pizazz. Cannot view the tutorial or find the pattern for fabric boxes. Has it been removed? Rated 1star since I can't see it. Is there any way I could make a copy of the cloth box, it looks easy, but I would forget what to do ha! !br br Lorita Austinbr Thanks!!!!!! !